Photo showing tomato rootstock seedlings experimentally grown under LEDs with 50 percent blue and 50 percent red photon flux. Higher blue photon flux during the photoperiod together with the end-of-day far-red light treatment can mitigate the problematic intumescence to an acceptable level. Credit: Tomomi Eguchi. Intumescence injury, also known as edema or oedema, is a nonpathogenic physiological disorder that can cause blister- or callus-like tumor growths to develop on the surface of leaves, petioles, and stems of plants. Problematic intumescence injury has been observed in many different plant species. Researchers from the School of Plant Sciences at The University of Arizona published a study in the June 2016 issue of HortScience in which they report on recommended light treatments to mitigate the disorder for tomato plants grown in UV light-deficient environments. Tomomi Eguchi, Ricardo Hernández, and Chieri Kubota said they had previously observed intumescence injury in some cultivars of tomato rootstocks seedlings cultivated in indoor production systems under electric lighting (especially under LEDs). In the current study, the scientists examined effects of end-of-day far-red (EOD-FR) light and high blue photon flux (PF) ratio during the photoperiod on intumescence injury using 'Beaufort' interspecific tomato rootstock seedlings, a cultivar highly susceptible to intumescence injury. The study included two experiments. In the first, the scientists examined EOD-FR light treatment as a means to inhibit intumescence injury of tomato plants grown under UV-deficient light. 'Beaufort' tomato plants were grown under cool-white fluorescent lamps or 10B-90R% light-emitting diodes without or with high dose of EOD-FR light treatment (67 mmol·m-2). In the second experiment, the scientists examined the relationship between intumescence injury and daily EOD-FR dose in which the daily minimum dose (intensity x duration) required to maximally inhibit intumescence injury was quantified. 'Beaufort' plants were grown under 10B-90R% or 75B-25R% LEDs without or with varied daily dose of EOD-FR light treatment (1-76 mmol·m-2). Additionally, they examined the combination of high blue PF ratio during the photoperiod and EOD-FR light for intumescence injury, plant growth, and morphology. Results showed that EOD-FR light treatment alleviated intumescence injury of tomato plants grown under red and blue LEDs deficient in UV-B radiation. "The mitigation response was saturated at a FR dose as low as 1.1 mmol·m-2·d-1," the authors noted. High blue PF ratio (75B-25R%) during the photoperiod also mitigated intumescence injury. "When the plants were grown under high blue PF ratio (75%) during the photoperiod combined with EOD-FR light treatment, the intumescence injury was further and sufficiently inhibited," the authors explained. "Also, under the combination of high blue PF ratio during the photoperiod and EOD-FR light treatment, undesirable stem elongation by EOD-FR light treatment was mitigated." 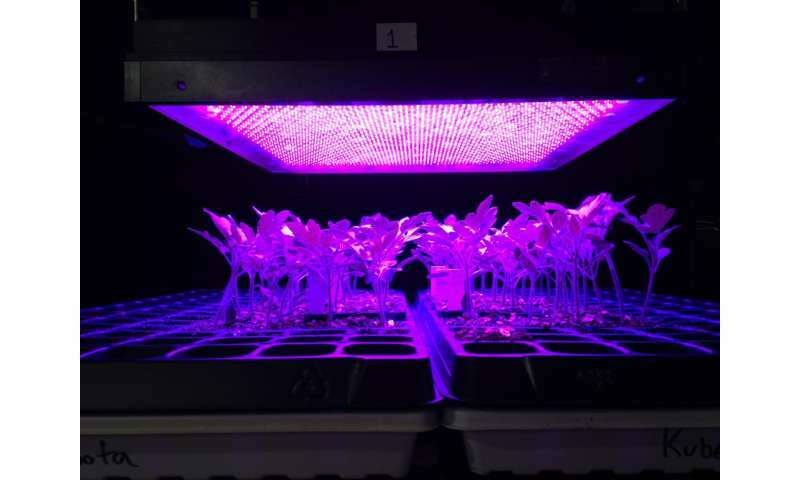 The researchers concluded that applying a small dose of EOD-FR light and high blue PF ratio during the photoperiod may provide a potential means to mitigate the problematic intumescence injury of tomato plants grown under LEDs or other environments deficient in UV light. "The synergistic effect of FR and blue was possibly through different photoreceptors and their interaction," they said.